You and the kids can print and assemble cute (and free!) Halloween goodies, compliments of the generous people of the internet. 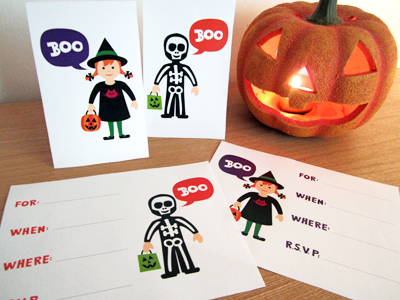 Get a massive "Boo"-themed party set by Love Party Printables, featured at Catch My Party. Or make paper Frankensteins by Bob Canada. Find a Halloween treat box template from Draw! Pilgrim—the link is at the bottom of Pilgrim's post. life in the married lane - little blog full of inspiration! Thank you so much for this! I was having a hard time finding a good prize for a little pumpkin carving contest I'm hosting tomorrow night. 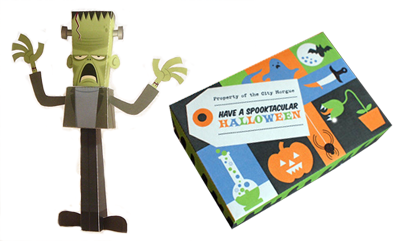 The box will be perfect for treats (and maybe that cute Frankenstein cutout)! Cute! The Frankenstein is pretty! Love the Frankenstein! There are all cute actually! Awesome. I was just looking for invite templates. this is very neat!! !...I like the ideas..fun a simple.